Angela and Guillaume had a night off of work together again, on Wednesday! They had planned to go to a restaurant called Brasserie Jo. Angela had been there for a work dinner or two, and didn't remember too much about it. So she wasn't sure if they should go there or not. Eventually (at the very last minute), they decided to go to a new French restaurant on Newbury Street, called La Voile. When Angela called on Wednesday afternoon for a reservation, the first table she was able to get was at 9:00 p.m. She thought it was a good sign that they were so busy on a Wednesday night! La Voile opened in Boston in November, and has been very successful so far. The restaurant moved from Cannes, France (where it was called La Voile au Vent) to Boston (where they lost au Vent! ), and they brought with them much of the staff (waiters, cooks, etc.). When Angela arrived at home from work on Wednesday evening, she was happy to see that her new shoes had arrived. Since she likes to take her camera when they go to dinner, the camera was on the kitchen island, ready to go, so she took a picture of her new shoe. Guillaume always carries the camera when they go out, so Angela thought that he put it in his pocket when they left. He didn't. There are no pictures of the food at La Voile. For a starter, they each had a type of foie gras. Angela had 3 kinds: a terrine, a brulee, and seared! 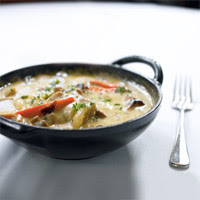 This picture Angela borrowed from another website of the dinner that she had - blanquette de veau. It was served in this pot, and on the side, another tiny cast-iron pot with rice. Guillaume had a leg of lamb that was delicious as well. They decided to forgo dessert this time, and have cheese instead. It was delicious, of course. They each had an espresso (with Illy coffee! ), and left La Voile very happy. They were busy on Thursday, Guillaume had to go to work for lunch, and Angela had her treatment. But at 5:30 p.m., when Angela had been home for an hour, Guillaume called and said he was coming home. Angela was so happy to have him home! 16 days to France! Hooray! Hello everybody..I was a long time whithout consulting blog...and what?? a new member in the family! !welcome to you Petit Robert!! Perhaps you can find a baby sitter at the Boston Aquarium! !..they are very kind people..
LOL because the aquarium idea sounded sarcastic at first! But yest they were kind in the end, and maybe Petit Robert could bunk with the penguins. salut Minet : Je t'envoie un mail sur ta messagerie. J'espère que cette "lettre" t'arrivera sinon je recommencerai. Ton pap' m'a envoyé ttes les photos de votre séjour à CHARTRES et + : super pour ma collection. Embrasse fort notre petite fille Angela.